"These are absolutely wonderful. You can either fry or grill the chicken, although in my opinion, fried is best! 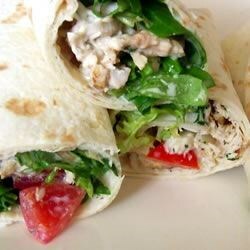 Another nice thing about these is that they take care of all your food groups in one wrap!" Grilled chicken method: Spray a large skillet with nonstick cooking spray. Add chicken, cook over medium-high heat 12 to 15 minutes, or until light brown and juices run clear. Add the water and bring to a boil. Add the rice, cover and remove form the heat and let stand for 5 minutes. Stir in the salad dressing. These were slightly bland and kind of "blah".